Old teabags and loose tea has always gone into my compost bin. I sometimes just throw out the old bags left in the cups for the dogs. After they have finished attacking and having fun with the left over paper and leaves just rot down into the beds or lawn. I have never really thought the old discarded tea holds any nutrients for plants but the added bulk in the garden couldn’t do any harm. I have occasionally in the past made the odd cup of real coffee for visitors and the coffee grounds left over are also put into the compost bin. As I get palpitations from drinking coffee nowadays, I am not one of these people that raves about the hundreds of different permutations available. Caffe Freddo, Con panna, Macchiato, Mazagran, Lungo are just a few types available that I might have had in the past but not known it. One type does sound quite attractive though called an Affogato. This is a term that means ‘drowned’. It is the description of a shot of separately served espresso that is later poured over a the top of a scoop of vanilla ice cream. I could be tempted. Anyway, caffeine addiction to one side, I am noticing that for every coffee shop that opens up in the area, there are ten people asking the staff for their leftover grounds to sprinkle on the garden. Some big multinational franchises now put their leftovers in bags and leave them on the counter for eager gardeners to call in and grab the bags when they become available. It’s a very efficient service that keeps the customers happy and means less waste filling up their bins or clogged drains for the shops as they try to rinse it down the sink. Coffee grounds will add bulk to the compost bin and you could always spread it neat around plants. I have read that it could be used to balance out the pH of soil but I think for that purpose you would need to add tonnes of it to the ground to have any effect. Fresh coffee is acidic compared to used coffee, which has a neutral pH of 6.5 so it’s really just bulking up the soil, which could improve drainage and help earthworms, but again you’d need a lot of it to make any difference. Putting coffee grounds on the garden is better than throwing them away, so I remain positive about its value. Some of the claims about their benefits I think are a bit overstated though I feel. It’s claimed the grounds are good for vermicomposting (which I wouldn’t doubt), can help to keep slugs and snails away, can be used to keep cats from depositing on the soil, suppressing weeds, sprinkle around acid-loving plants like azaleas, hydrangea, helping root vegetables, suppressing weeds and keeping rabbits away. 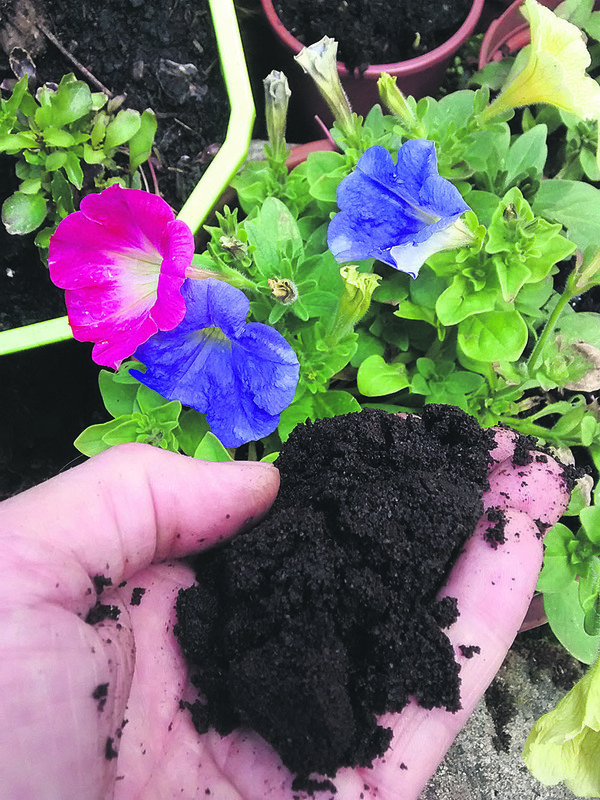 There are only a few negatives surrounding the coffee grounds such as tomatoes not liking them and suppressing some fungal pathogens, but apart from that the grounds will surely be better off in your garden than in a wheelie bin. Like all drugs, people who use them like to share, in this caffeinated case, it’s with the garden. Do you have a barbeque set up in the garden? Like most of us, the answer is probably ‘yes’. There are some fabulous examples on the market from the tiny wok shaped bowl, half barrels, brickwork ones, to the all bells and whistles types that are larger than the fireplace in the front room. I saw one that was a replica of an old steam train, albeit a tad smaller, which was very impressive and came with its own Casey Jones-style railway hat. If I do have a Barbie this year it’ll be one of the disposable types. In our last house we had a large brick one but only used it about once a year so it didn’t really justify taking up the space. There are a lot of us who will be at the DIY shops picking up new shiny ones as the old rusty ones go into a skip. Like children playing, rumbling lawnmowers at ten o’clock on a Sunday morning, blasting radios and dogs barking, barbeques tend to be at their busiest when the sun shines. I really like the smell of cooking sausages and chicken wafting over from the neighbours’ houses but not everyone feels the same. Maybe next time you light up the coals, ask the neighbours around too and you can all join in the fun. I’ll keep my floury burger baps on standby just in case I get an invite.